The Worst Animals on Earth! We hate them because they bite you and it really itches. They can bite you anywhere but they can’t bite through clothes. They come out about six o’clock. 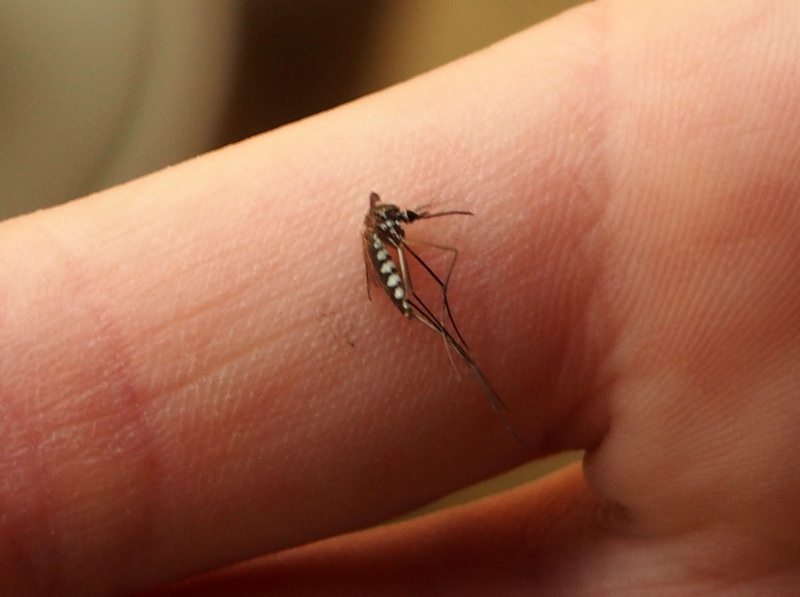 We’ve bought a mosquito repellant called Deet which keeps them away quite well, although sometimes we still get bitten. The most mosquitoey place we’ve been in travelling is Chitwan where there were loads of giant mosquitos which didn’t even go to sleep in the day. 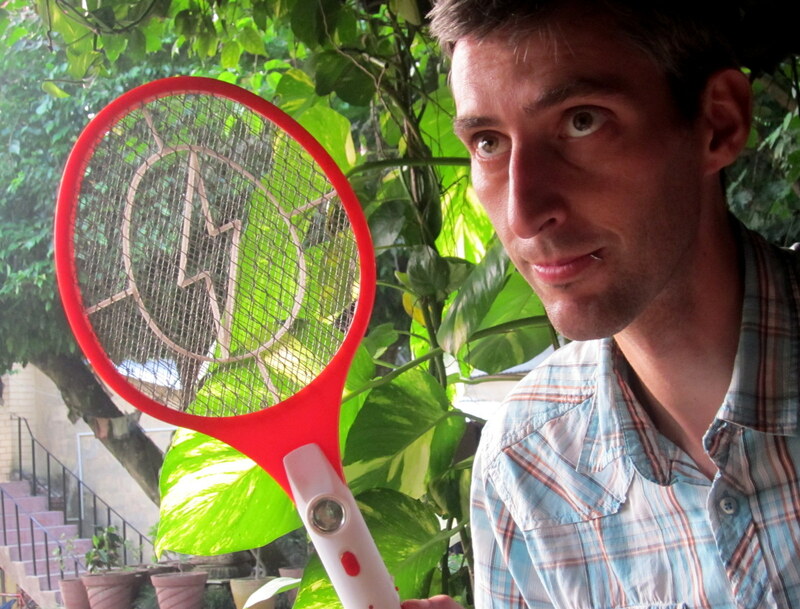 As well as buying Deet, we bought a mosquito racquet. It looks like a tennis racquet with a big lightning flash in the midde and when you turn it on a hit a mosquito with it, it electrifies them and they die. We have used it on bees and wasps as well. 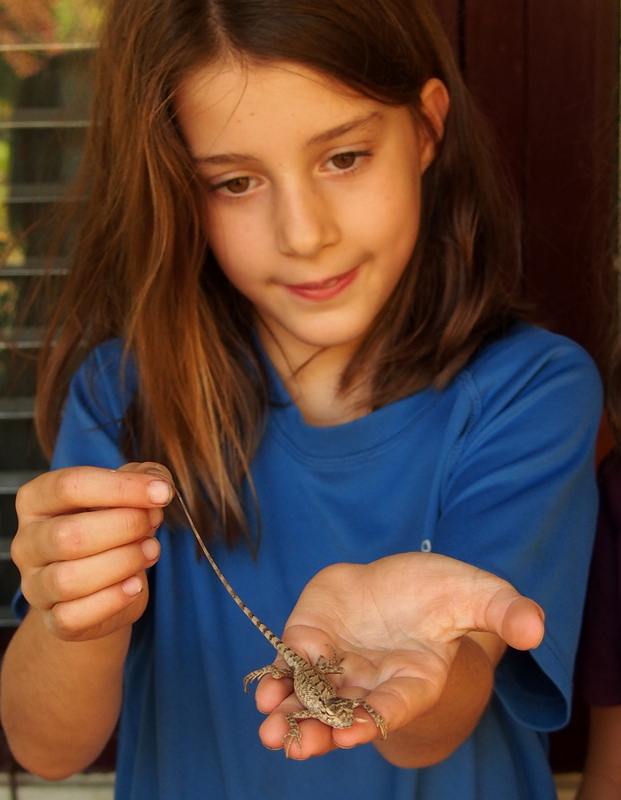 There are lizards that you will see in Thailand, Laos and Nepal called geckos. They eat mosquitos and are friendly. They wait near the lights because mosquitos are attracted to those places. Mosquitos used to bite Mummy the most but now they hate (or love eating) Tettie as well. She had more than 20 mosquito bites on her legs – they were covered! She couldn’t stop scratching them but she shouldn’t do that because it makes them bigger. Luckily, they hardly bite me at all. The first item was from the hospital and the best present any of us could have asked for. The doctor says that Scarlett’s leg is healing so well that she may only need two weeks with her half-leg cast, not six. She’s been soldiering on with her hip-high cast for a month and half now and was being very brave about having to manage for another six weeks. Everything else was from the massive Tesco near Chaweng beach. I know it’s bad form to buy yourself stuff just before Christmas but Samui’s the only place we’re going to visit in the next few months with clothes and shoes big enough for me and I’ve been wanting some trainers. When packing, I thought I wouldn’t need any so left mine at home, but, having ditched my walking boots in Nepal, and now having only sandas, I’ve decided I’m going to need some more enclosed footwear for walking through grass (snakes) and up volcanoes (stones). 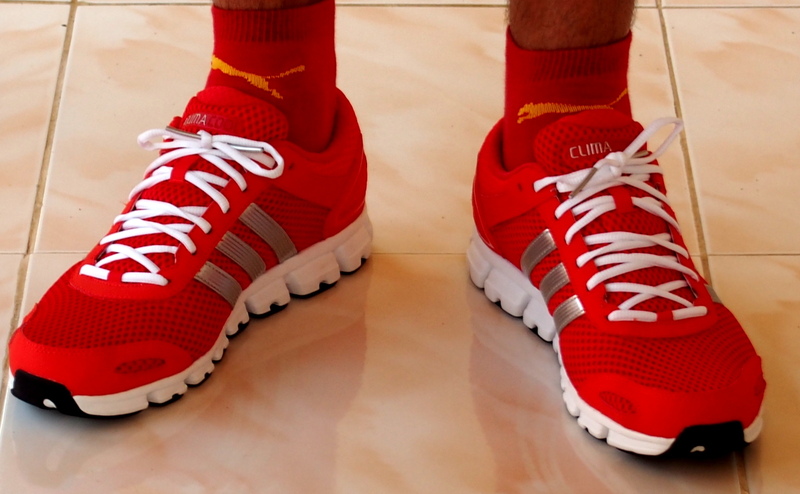 I’ve also been wanting to go jogging and it’s just not possible in flip flops. Unfortunately, even hre, the only ones big enough were shockingly bright red. At least it’s a Christmassy colour. With our bungalow decorated (and my new trainers), it’s finally starting to feel like Christmas here. We have wine and cheese. We’ve wrapped up the girls’ presents, sent at great expense and difficulty from the UK by my mum and dad. We’ve got three walking socks hung up for Santa to fill, a glass of beer (can’t find sherry) for him to drink and some edamame beans for Rudolph (nor carrots). We even have five M&S Christmas puddings (also from my Mum’s aid parcel). Tomorrow, we’ll open presents in the morning, go swimming in the sea till lunchtime, eat fish at a beach restaurant in the afternoon, then Skype our relatives before heading over to a swanky Italian restaurant in Chaweng for a posh Christmas dinner in the evening (oysters, giant prawns, roulade of turkey with chestnut puree stuffing, pannatone gelato). Not a traditional Christmas, perhaps, but it should be fun, and will hopefully have enough of what we’re used to feel familiar. Anyway, the cheese is chopped (and getting slightly sweaty), the chocolate is unwrapped (and beginning to melt) and the Muppet’s Christmas Carol is queued up on the laptop. Time to start those Christmas traditions we can still observe over her in Thailand. 1. Describe a journey in Nepal including 5 things that are different to England. Fergus: Wait a minute, didn’t I already write a post all about this. Alright, alright, I’ll do another one. How about walking through Thamel, the tourist district of Kathmandu. And then there’s the traffic; in a land without pavements the car is king, but it’s the motorbikes that’ll get you. Weaving in and out of the pedestrians, cars, carts, wheeled stalls and bicycles, motorbikes come snarling at your heels, beeping for right of way. Mix into all of this the CD and ethnic goods shops that all play the same Om Mane Padme Hom tune relentlessly on repeat, the dust in the air that has you rasping within hours and the occasional scabrous street dog, and you have journey that is always exhilarating, no matter how short. Janet: As I’m writing this on the plane, I’ll reflect on the journey this morning to the airport. Kathmandu awakes to the sound of baying dogs, tea-vendors and the unceasing honking of horns. We leave the hotel before dawn, bleary eyed but ready for the adventure of a new country. As I leave this strange and wonderful land behind, I notice with an affectionate fondness the myriad of tiny shops, the haphazard layout of the streets and the stunning backdrop of 360 degree mountain ranges. I am no longer afraid of the seemingly endless series of what we would call ‘near misses’ on the roads in England. The swerving of the taxi past the rickshaws, mangy dogs and motorbikes feels calm at this early hour compared to many of the journeys we’ve made. It’s a little out of town to the airport, which means we go past some of the more humble residencies of this city. After 3 months, it still never ceases to make me draw in breath sharply and clench my stomach to see some of the places people call home. I vow never again to complain about the children sharing a room as I see the families crowded into shacks with no fronts, huddled around a fire made of rubbish to keep away the morning chills. We arrive to the usual barrage of offers of help to carry bags (for a few rupees, why not?) and polite enquiries of, “Three daughters? All same same?” which has recently almost been usurped by, “What happen?” in reference to Scarlett’s broken leg. I’m struck by the contrast between the many and varied international airports I’ve travelled through compared with this one. It’s the little things. Like the fact that the entire row of seats tips forwards as Scarlett sits down – they’re not screwed to the floor. And the fact that we spot 4 birds and 1 cat on our way to the departure gate. Indoors. That’s not normal. We’ve overstayed our Visas due to Scarlett’s accident, only by a day, but we expect to pay a $66 USD fine. However, with a muttering of, “Today, 17th”, and a characteristic wobble of the head, we are waved through passport control with no fine to pay. So we have a relatively large sum of money in a currency you can’t change outside of Nepal, no bank, and the limited airport shops. The choice is between some T Shirts that don’t fit any of us, some chocolate, a fridge magnet or a coffee. We settle on a drink each and a T-shirt for Evie (she’s one down) and give the rest to a children’s charity. It’s a lovely way to spend our last morning. Nothing is quite ‘normal’ but that’s kind of what makes it fun, and it’s definitely what makes it Nepal. The internet in Nepal is so slow it is often unusable, so I quickly had to break my web habit. Facebook loses it’s shine when it takes 40 minutes to load. Travel takes ages. Food comes slowly in cafés. Bureaucracy requires more chitties, desks and members of staff than I ever though possible. In fact, any kind of organizational task needs a whole day setting aside to perform. But if you slow down, it’s fine. When in Nepal, go as fast as the Nepalese go. Janet: …to be polite. Now being British, we pride ourselves on being polite. I like politeness, and I like people to treat me with courtesy and respect. But even the famed reserve of the English cannot compare to the Nepali culture. The way that everybody in this land conducts themselves is both alien and admirable to me. I realise, slowly, over the months that we spend here, the difference between what I think is polite and what is actually polite here. For example, it’s fine to ask personal questions about your family, your job, even your income. But it’s not OK to raise your voice, to be impatient or, worst of all, to loose your temper. It’s sometimes a subtle touch of the arm as you hand over money, a nod of the head to acknowledge thanks, and of course the head wobble, but if you can get into the local body language you find people respond with a smile and with a polite interest in getting to know you better. I’m glad we stayed long enough to get a real feel for this part of the Nepali culture. Fergus: …spending every day with my family. Trekking together was wonderful. It gave us the time to talk and to listen. And there’s something about walking that makes thinking somehow clearer. But even in the cities or Sauraha, we’ve had time to really enjoy being in our little family unit. No school or work to separate us. No demands from laundry, shopping, housekeeping or garden to drain our free time. Just us, every day; talking, learning, laughing, playing games, eating, exploring. Janet: …the mountains. I simply love being in mountains. Since the age of about 13 when I went of my first walking holiday with a group of girlfriends from school I’ve been totally hooked on mountain walking. My greatest achievements in mountaineering don’t amount to much: I’ve done the coast to coast walk (solo!) and the Yorkshire and National 3 Peaks, but nothing on earth can compare to your first view of the Himalayan Massif. There are no adjectives adequate for the spectacle. I won’t do it the injustice of trying to describe it in words. But for me, this is what I came to Nepal for, and stepping onto the summit of Gokyo Ri and turning around to admire the view on all sides will always be my personal highlight. Of course, Scarlett’s accident was the biggest unexpected event, and I realize now that it threw us all into shock. But there have been other changes of plan, too. Not going to India. Not going to Sri Lanka. Rejigging our time in Thailand to hit most of the beaches after Scarlett’s cast is finally removed in February. Plus, just going to new places means one never truly knows what arrival will bring with it. Having the future so much in flux can be unsettling but it’s good to be shaken out of my routine. Not knowing what might happen tomorrow brings today into focus and makes me notice the passage of time in a way that I never do back home. In fact, being thrown into unexpected situations reason – good and bad – is much of what makes travelling so rewarding. In responding to a challenge, you find out who you are and what you’re capable of; you grow. And doing the same thing you did yesterday never made for much of an anecdote. Janet: …bureaucracy! OK, so obviously the worst thing that happened was Scarlett breaking her leg, and the resulting shock that I was thrown into. But if you wanted to make a bad situation worse, you couldn’t have done it better than adding in a dose of Nepali bureaucracy to the equation. As a previous post describes, it’s one thing I’ll be glad to leave behind. Not that I’m expecting SE Asia to be much better, I’m just hoping not to have to do anything so ambitious that involves any level of paperwork! 5. Describe a Nepali person you have met. Include what they look like, their personality and your opinion of them. Fergus: I’m going to go for Phurba Sherpa, too. We were walking with him day in, day out for nearly a month, and got to know him better than anyone else we’ve met. He had the physique common to many Sherpa people; broad shoulders, thickly-muscled calves, the body of a man who has carried massive loads into the clouds, year after year. He was always calm and polite. He seldom smiled, although the kids would make him laugh sometimes, especially in their wilder moments. Quiet, understated, assiduous and reliable, he was always working to smooth our relations with locals, to help us order food or find the best place to stop, and was always on hand when needed from dawn till dusk. He was a family man and, I guess because he was away from his own kids, he became very protective and kind to our own, several times carrying one girl or another when they ran out of steam and often buying sweets or snacks for them as we walked. Turning up in the Everest Region completely without a guide was a gamble, but it paid off in meeting Phurba. Janet: One of the silver linings of Scarlett’s accident is getting to know some of the people in Sauraha, near Chitwan National Park. Having returned there to rest and recuperate, some people welcomed us back like old friends, most notably a shop owner who was always very taken with the girls. Being triplets, they attract a lot of attention, and he sold them 3 lovely dresses which he was very proud of as they walked down the main road in them on an almost daily basis. When he saw Scarlett’s leg in a cast, he was genuinely heartbroken, he took my hand in both his and vowed that if there was anything, anything at all he could do to help us, he would help. He said he has a car, and could drive us to hospital any time of day or night if we needed it. It was very touching. The help we ended up taking was his offer of teaching Scarlett the Nepali ‘Tiger Moving Game’. As Evie and Jemima headed off to elephant bath time each day, Scarlett and I would make our way down the road to his shop, where we’d play a couple of rounds of this local chess-like game. It helped us to get a change of scene, it gave Scarlett something to look forward to, and made her feel special when she would otherwise have felt left out. He was a middle aged man, a little larger than the typical Nepali build, with the smart dress sense of a man who has made it into the middle classes of Nepali society. Softly spoken, but outgoing and friendly to everyone, he chatted to us about his early morning badminton matches, the births and deaths within the local community, and the trouble of keeping the dust and bugs out of the shop. I’ll miss the slow pace of these daily conversations and the feeling of belonging to a tiny part of the community that this friendship gave me and Scarlett during our unexpectedly long stay in this small part of the world. 6. Make 3 recommendations for an English person who is planning to visit Nepal. Learn to love lentils. Seriously. You could never call the Nepali diet adventurous. In fact, most Nepalis eat the same meal every single day: daal bhat (which literally means dahl and rice but is normally served with some or all of wilted spinach, mild vegetable curry, yoghurt, bitter pickles and popadom). You don’t visit Nepal for the food. Get fit. Walking up mountains is a lot easier if you’ve, well, walked up some mountains before. Even English ones (which our guide thought hilarious we called mountains at all). Don’t get carried away buying trekking gear. Like most foreigners we were kitted out in expensive boots, base layers, thermal layers, fleeces, goretex jackets, walking trousers, walking socks, buffs and hats… while many sherpas wore jeans and even flip-flops, with a carrier bag containing trainers and a jacket for when they got higher. Not that I’d go that far, but really, only good boots, walking socks and a warm jacket are really essential. And anything you don’t have, you can buy much cheaper in Nepal once you decide that you need it. Trek! You can’t go to Nepal and not see the mountains. Train for it, prepare for it, buy the right equipment for it (possibly in Thamel at a fraction of English prices) and enjoy it. You won’t regret it. Lower Your Expectations when it comes to accommodation. You need to learn to be delighted by hot water, rather than disappointed by lack of it. Only then can you truly appreciate your surroundings. Look Out for those cliff edges. You could break a leg. Fergus: …mountains. No, elephants. No, mountains. Can I have both? I fell in love with the mountains when we were trekking, and came to love being close up to elephants in the lowlands. In both cases, as I spent more time in their company I came to see their idiosyncrasies. They no longer looked the same (as one another, I mean – I can tell a mountain from an elephant), and I could see what made each interesting, impressive or beautiful. Janet: …the helicopter ride out of the Annapurna region. The ultimate day of highs and lows. The shock of Scarlett falling. The realisation that it wasn’t just a sprain. The waiting for the insurance to call back. The relief that they would pay for her to be flown out. The crowd of people taking photos as the helicopter landed for us. The way their hair blew back as we sat in the cockpit and waved. Their friendly gestures in many languages, pointing at legs and thumbs up signs, conveying their get-well-soon messages. The stomach flipping take off. The breathtaking panorama of mountains surrounding us. The gnawing anxiety over what Scarett’s X ray would show. The growing guilt that it was my idea to come here, to put her in this danger. The relief that the hospital was well equipped. The surprise that it was in Kathmandu. The dawning of the idea that this could be the end of the trip. The trouble of sleeping on the sofa-bed that first night. The wondering what would happen to a local girl, aged 8, with no such medical care, if the same thing happened to her. Ultimately, the gratitude in realising that we are very, very lucky. Very lucky indeed. These are things that I will remember for ever. Evie: If you want to make a bus journey in Nepal you have to be prepared for a wild, bumpy journey during which you will probabley feel sick. Flashing by you catch glimses of mangy old dogs which doesn’t help your already horrible sick-feeling. Next to all the dogs you find yourself rattling along a cliff ledge with a terrifying drop below you and a towering cliff above you. When you finally reach your destination you find chat-pot stalls flashing by instead of the terrifying scenes that have already been described to you. Scarlett: When making a taxi journey in Nepal you might see a Chat-pot stall which you would not see in England. A chat-pot stall is a tipe of street food. It is a lot of dried noodles mixed with pulses and spices. You also might see a half finished building held up by bamboo poles which stretch between one floor and the roof, criss-crossing. Another thing you would see is mangy old dogs with bold patches all over them and grey skin. They make me feel horrid! You would deffinately see little, golden Buddhas sitting in the frames of a wound up window. When the sun is up they will shine and twinkle in its reddish rays. Finnaly, you might see the same Bamboo swings. These are four bamboo poles stuck in the ground. Two of them are criss-crossing on the right. One bamboo pole with ropes hanging off it is resting on the criss-crossing on the ropes there is a plank of wood. Everest looming up and fountain mist. Sherpas carrying things on their heads and things with Everest in their names. Little children saying, “Namaste”. These are some of the things you might see along the way. Scarlett: In Nepal I have learned that honking your horn means “I’m coming past you!” I have also learned that in Chitwan it is legal to ride Elephants in the street. The last thing I’ve learned is that there is a lot of guest houses with the word ‘Everest’ in them. Scarlett: In Nepal I have enjoyed having elephants. I have also enjoyed having both Mummy and Daddy with me. Lastly, I have enjoyed playing. Jemima: In Nepal, I have endured going up Gokyo Ri and getting half an altitude headache; bus journeys and feeling sick on them; trying to manage with only half a suger lump in my tea when I like a full one; living in Kathmandu when there is no where to play. Evie: In Nepal, I have endured bus journeys because they are bumpy and seem to take forever; climbing to Gokyo in the wind and the snow; watching Tettie break her leg. Scarlett: In Nepal, I have endured going up Gokyo Ri. It was so hard. And what did I come up for? An altitude headache! I have also endured having a broken leg. But I’m over that now. The last thing I want to talk about that I’ve endured is a terrible taxi journey. Evie: This person’s name is Phurba Sherpa. He is a half-famous porter-guide who travelled with us and helped us carry our bags and find our way. He had black hair, brown skin and was very kind. We travelled with another porter called Hari who doesn’t speak English. Phurba kept shouting, “Hari, O Hari!” over and over again. Our whole family liked Phurba and he bought us lots of sweets! He is a porter-guide and Daddy is half way through making a website about him. He is small and happy with black hair and brown eyes. If he goes with a porter called Hari he is always shouting, “O Hari, O Hari!” over and over again. He is kind and kept buying us sweets! I like him. Scarlett: I’m going to describe my friend. I met him in Chitwan National Park. His name was Bharat Kattel. Every elephant bathtime he would play the tiger moving game with me. Like all Nepalese people he had brown skin and a long nose. He was friendly and said I was clever at the tiger moving game. He gave me a 400 discount for a copy of the tiger moving game. He makes a lot of jokes. I love him and miss him when he’s away. Go to Chitwan and do an elephant safari because it is brilliant. Stay in Kathmandu the least time you can with children. Go on a jeep safari if you ever go to Chitwan. This is because you get ever so far into the jungle. Lastly go trekking because of the view. Scarlett: The thing I will remember most about Nepal is the elephants. They were like huge boulders rumbling along the road with the mahoots balancing on top. Evie: The thing I will remember most about Nepal is the elephants because they had different faces. They towered above people, motorbikes and horse and carts. They are hairy and tickle your legs when you sit on them! Jemima: The thing I will most remember about Nepal is the elephants because it was the first time I had ever seen them. They are hit a lot by the mahoots which makes me feel sorry for them. Is it really three weeks? Tomorrow we get on a bus to travel 7 hours over potholed roads edged with precipitous drops and soaring cliff faces to Kathmandu, then after 24 hours rest and a last chance to eat cheese before hitting SE Asia, we fly first to Delhi then Bangkok, where, after another brief 24 hour rest, we jump on a sleeper train,then a ferry, then a songtiaw to Maenam on the island of Ko Samui. That’s five days of travelling. But I am really looking forward to it. We’ve been very sedentary here in Sauraha but Scarlett had a checkup with her orthopaedic surgeon this week and he’s happy for her to start moving around more now. So we’re hitting the beach! Hooray, he’s back safe and… he has the parcel! 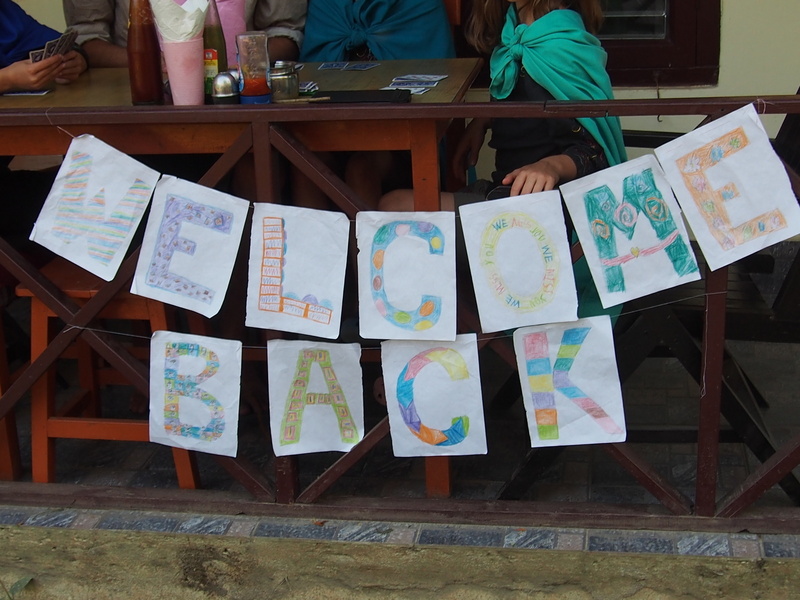 Here’s the welcome party, complete with Harry Potter outfits, a home-made banner and party food. All suggested by the girls, they really did miss their Daddy. Thank you so much to Avril and Rob, the parcel feels like a real haul of goodies! Acquiring the parcel from customs was rather a saga, but I’ll let Ferg update you on the full story. The main thing is that Scarlett how has her waterproof cast cover ready for Thailand’s beaches, there’s real English chocolate for Christmas Day, and we can all have a lovely cup of Redbush tea… wonderful. 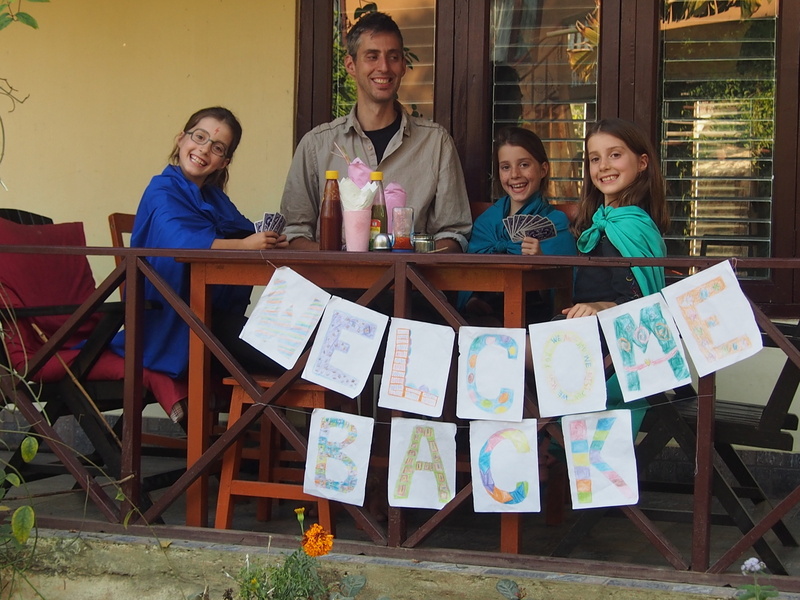 Due to another Nepali Admin saga that is just too long and dull to type out, I am in Sauraha with the 3 rug-rats while Fergus has had to go on a 3 day mission to Kathmandu to get a parcel of goodies that we’ve had sent to us. Now, I know that in the not too distant past I used to be able to look after all my children on my own with no issues, so I’m not sure why I feel so nervous about it! Maybe it’s having Scarlett on crutches; maybe it’s being in a foreign land; maybe it’s that we have 3 Daddy’s girls who hang on his every word; maybe it’s that I’ve just not had to do it for so long; but it feels like a big challenge. Anyway, I sat them down and explained how we’d have to work as a team to make it fun while Daddy’s away, and how we have to do extra good behavior. I was asked in turn to also do extra good behavior and not be strict or shout. So we have a deal. And the Dairy Milk and hour in an internet cafe with a computer each won’t hurt either.